Origin is a uniquely designed program for teaching the traditional arts of Asia. The name Origin refers to our basic aim: to introduce the spiritual origins of each country's art and culture, the wisdom which lies hidden within the traditional arts. This experience gives people a set of mental tools to understand the culture they are in. Later, one can recognize these basic principles everywhere: in the look of homes, towns, and cities, in contemporary arts, and in the way people treat each other in daily life. At present, we offer Origin programs in three locations: Kyoto, Bangkok, and Chiangmai. In the future, we hope to expand the Origin program to other locations in Japan, as well as other nations of Asia. Origin focuses on direct physical experience of the arts. 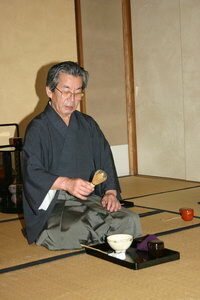 In Japan, participants actually stand on a Noh stage and learn how to walk holding the Noh fan; write calligraphy holding a brush; perform the basics of preparing tea in tea ceremony and so forth. In Thailand, participants learn how to sit, walk, and wai (pay respect by raising the hands with palms together), prepare traditional flower offerings by folding banana leaves, draw classical patterns using gold leaf, etc. At the same time, we provide critical background and cultural overview to put the arts into an understandable context. Most programs run for a relatively brief time - usually one or two days - but the experience of having done these arts oneself, with clear explanation, affects everything one later sees in the culture. One cannot see a dance or look at a painting without remembering back to this experience, which can be truly transformative. For more information on the background and approach of Origin, please see Concept & Program Planning and History of Origin.